Glen Dimplex Americas is focused on enhancing the moments that matter in life. At home or at work. Our dynamic portfolio of leading brands and low carbon technologies are strategically positioned to meet the market challenges of tomorrow by enhancing the moments that matter in life and in the environment. In 1991, Dimplex North America Limited entered the North American market by acquiring several leading electric heating brands – Electromode, Sentinel, Chromalox and Westcan. New product development has long been a hallmark of Dimplex North America Limited. Recent innovations include: the patented electric flame technology - the company made history in the fireplace industry when it developed and produced the first electric fireplace with a truly realistic ''wood burning'' flame effect in 1995. The company has since been granted 30 patents covering various areas of electric flame technology and others are pending. Stoves, fireplaces and specialty fireplaces are sold throughout North America under the Dimplex brand name. 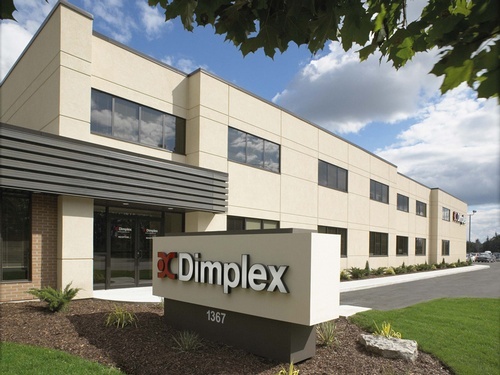 Dimplex North America Limited is headquartered in a 200,000 square foot manufacturing and distribution facility located in Cambridge, Ontario. To service the company's customer base throughout the United States Dimplex operates a 218,000 square foot distribution facility located in Indianapolis, Indiana.